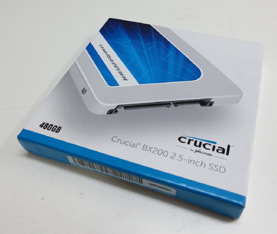 Today on the testbench we have the Crucial BX200 2.5-inch SSD. Crucial and Lexar, as you may remember from our previous USB drive review, are subsidiaries of Micron, one of the largest memory and storage manufacturers in the world, based in the USA. Lexar's focus is on memory cards and USB sticks etc, while Crucial are more on the PC component side, including DRAM and SSDs - like this one. 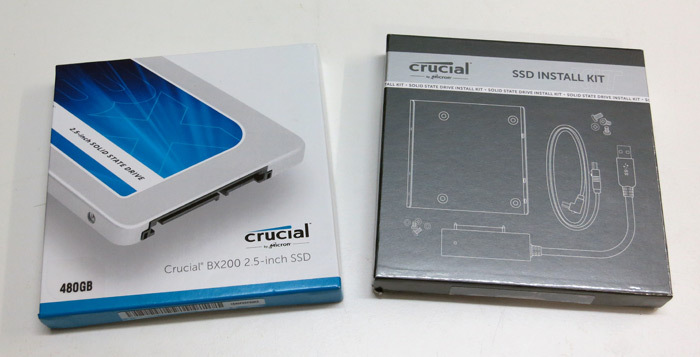 Crucial's BX200 SSD is available in 240GB, 480GB and 960GB capacities. Our focus today is on the 480GB but we do also have a 240GB to include in the testing. 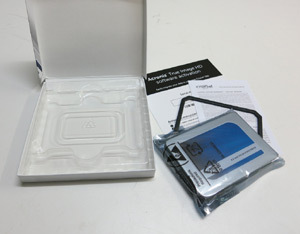 The drive comes in an attractive little package and interestingly includes a separate box marked "SSD Install Kit". 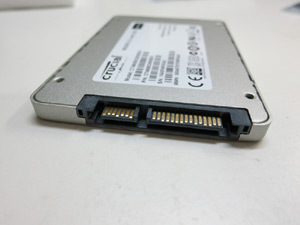 The drive box contains the drive itself, info on the 3-year warranty and a 2.5mm spacer. That spacer lets you install this 7mm-high drive info devices with 9mm-high bays. There's also license info for a free copy of Acronis True Image HD, which is a very handy program for copying an image of the data on your old drive onto the new drive. 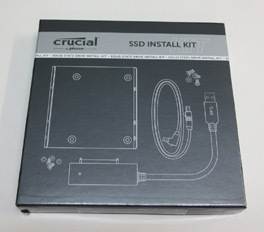 That brings us to the second box, the "SSD Install Kit". 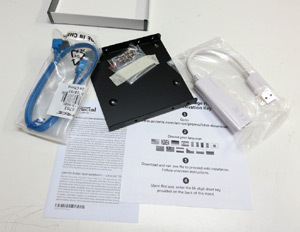 This includes a SATA cable, mounting screws, 2.5" to 3.5" adapter bracket and a USB to SATA converter cable. There's also another, different, license key for Acronis True Image HD. Interesting. Anyway, this package is a very handy inclusion which really sets this Crucial drive apart from other drives I've seen. The USB to SATA cable itself is a very useful thing to keep around for the future and really simplifies the process of upgrading your system - especially if you're using a laptop with only one drive bay. 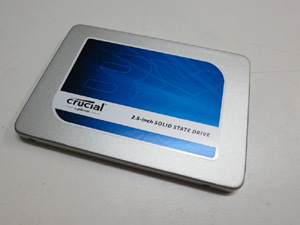 The drive itself has a nice matte silver outer shell, a blue Crucial sticker and the standard SATA power and data connectors. This is a TLC-based drive, which places it in the budget arena, but like other drives using TLC it has an SLC-based cache to help with the write speeds. It also has a thermal sensor to keep an eye on temperatures and it supports DevSleep so it uses very little power when idle. I had a quick play with Crucial's "Storage Executive" utility, which is a 122MB download and runs in your browser. It seems fairly handy and is an easy way to check and update the firmware in your drives, as well as monitoring temperatures and the total data written to the drive during its lifetime. One new feature of Storage Executive is "Momentum Cache". This uses your system RAM to buffer interaction with the drive itself, in the hope of improving performance. I haven't enabled that during our performance testing because if you want to do that kind of thing there are various options available, and in normal use the operating system does that to some degree anyway - although write caching is usually disabled by default. The reason why write caching via system RAM isn't a great idea is due to the risk of data loss or corruption if you have a power issue before the data is written to the drive. In fact, even the Momentum Cache page in the Storage Executive utility strongly cautions against using the feature without a battery backup. So we'll leave it off for now. It may be useful if you use this drive in a laptop. But otherwise, Storage Executive is quite useful and seems to work well. I updated both the Crucial drives to the latest (MU02) firmware before testing. So, on to testing. For these tests I'll be using a Windows 10 Pro x64 PC with 8GB of RAM and an i5-4690S CPU at 3.2GHz on an ASUS Z97-A motherboard, using the onboard SATA3 connectors. I have the Crucial BX200 in 240GB and 480GB capacities, and for comparison I have an older Corsair Force GS 240GB (much more heavily used and nearly full of data) and a newer ADATA SP550 240GB (reviewed here). 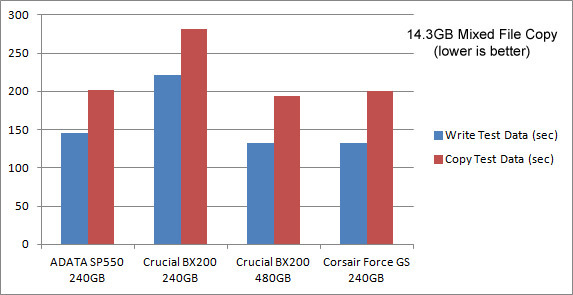 Interestingly, Crucial rate the 240GB and 480GB BX200s at exactly the same speed. Sometimes you see larger drives being quicker due to how reading and writing is distributed by the controller but that is apparently not true in this case. We'll see, I suppose! First up, the AS SSD benchmark in the default 1GB mode, which gives us a basic sequential read and write speed for each drive. I ran each test four times in a row and averaged the results. The two Crucial drives do indeed show almost identical performance here, along with the ADATA drive. 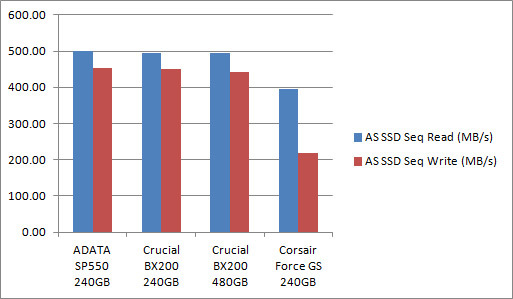 The older Corsair drive gets left behind, particularly on the write test. Next I used PCMark Vantage, an older benchmark but still favoured for storage testing as it has a HDD test suite which plays back data traces recorded while performing common tasks. This is a busy graph but clearly the older Corsair drive is left behind again, while the three newer TLC-based drives are much closer. 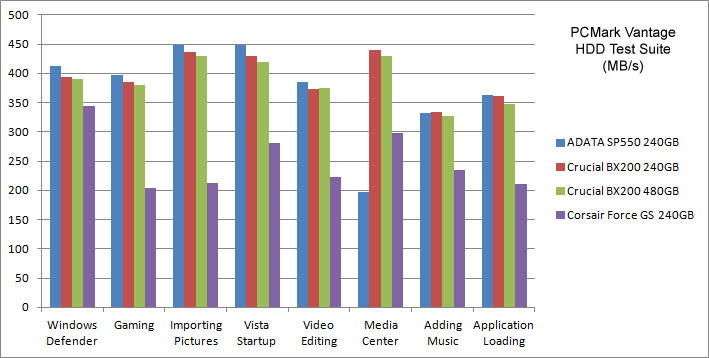 The exception (which is odd, but repeatable) is the ADATA lagging behind in the "Media Center" segment of the test suite. Finally, for some real world testing I made up a folder of test data. This test data set consisted of some large media files of 400MB to 1.5GB each, one 6GB .bz2 archive, nearly a thousand photos and small videos from my camera, two thousand small documents and spreadsheets and a couple of application installation directories. In total, 3,400 files adding up to 14.3GB. This data set was first copied to each drive from a much faster PCIe SSD. I then copied it from each drive onto itself again, leaving two copies on the drive being tested. In each case I simply timed the copy operations with a stopwatch. Each test was repeated twice and the times averaged. Remember lower is better in that last graph. Here the result is slightly odd. We see fairly even performance from the Corsair, ADATA and the 480GB Crucial, but the 240GB Crucial took quite a bit longer in this real-world test. I re-ran the tests several times on the two Crucial drives with the same result. In each test, the drives start out quite fast, then the speed decays over time, presumably as caches are exhausted. Then the drive continues at a lower baseline speed until all the data has been copied. This decaying process happened much more rapidly on the 240GB drive than the 480GB, and the 480GB would cycle back up to slightly faster speeds occasionally as it hit batches of smaller files etc. I'm struggling to explain this, as I couldn't find any info about different-sized caches or anything else that would explain the performance difference. But it was completely repeatable, so we have to accept it. It's somewhat telling that Crucial's marketing info for the BX200 range of drives compares them to hard drives. Clearly they are targeting these at someone who is looking to upgrade an older PC or laptop from a spindle-based HDD to an SSD. 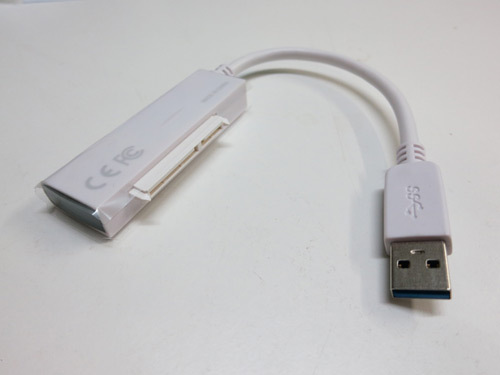 The inclusion of the installation kit with USB-SATA cable would also appeal to those users. A quick search shows the 240GB available for about $100 AUD, and the 480GB, appropriately enough, for about double that. That's in the same ballpark as other entry-level SSDs in those sizes. Performance wise they more or less hold their own in our testing as well. So, if you're looking for an economical SSD with a 3-year warranty from a big-name manufacturer, Crucial's BX200 should be on your short list. The handy SSD install kit might sway your decision their way as well. Thanks to Micron for providing the review sample. Feel free to discuss this review in this thread.